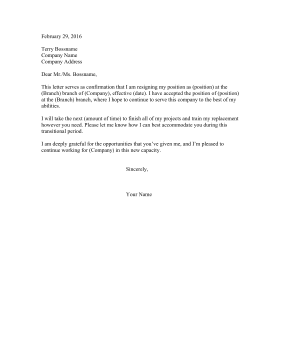 When transferring to a different branch of a company, use this resignation letter for your current position. This letter serves as confirmation that I am resigning my position as (position) at the (Branch) branch of (Company), effective (date). I have accepted the position of (position) at the (Branch) branch, where I hope to continue to serve this company to the best of my abilities. I will take the next (amount of time) to finish all of my projects and train my replacement however you need. Please let me know how I can best accommodate you during this transitional period. I am deeply grateful for the opportunities that you've given me, and I'm pleased to continue working for (Company) in this new capacity.